Jet skis and pirates feature in the upcoming DLC. 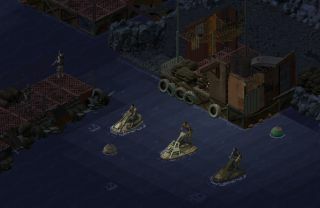 You're probably already aware, if you're a CRPG fan, but Underrail—that's the isometric, post-apocalyptic RPG set on and around an underground train network—has an expansion in the works. The Expedition DLC is still subterranean, but features an underground sea you'll be exploring with the aid of jet skis. Also, there are pirates, as the above screenshot entitled 'PiratesOnJetskis.png' illustrates. Stygian Software had previously reckoned that Expedition would be out sometime in the first half of 2017, which obviously didn't happen, however estimated release dates and all that. A lot of work has been done on it though, as a new blog post on Stygian's site explains. "Just wanted to let you all know that, even though we've been quiet, we're working hard on getting all the content for the expansion done, now that all the new mechanics have been implemented. The good news is that the the bulk of the main quest, including all the heavy scripting, c&c, etc, is complete and functioning (for the most part, it needs further testing, of course). "For those who just can't wait to get to explore the Black Sea themselves, here's a short video from the recent internal testing that we've done (this is NOT a trailer). It does contain some spoilers, though we tried to censor the important stuff, so be warned." Oh yeah, that's the other thing: there's a new trail—er, a new short video, offering nearly nine minutes of footage for your edification. No new release date that I can see, but it sounds like Expedition isn't too far away.